Jerusalem artichokes, a Trojan horse? It might be that next summer, after Jerusalem artichokes have taken over the herb garden, I will curse the moment I planted them, disregarding all warnings against this supposedly highly invasive crop. For now, I am quite happy with my very first harvest of those crunchy little tubers. Boldly I am thinking that if I can can keep various mint plants under control, why shouldn’t I be able to do the same with Jerusalem artichokes? We’ll see next summer if they are manageable, and not a Trojan horse. 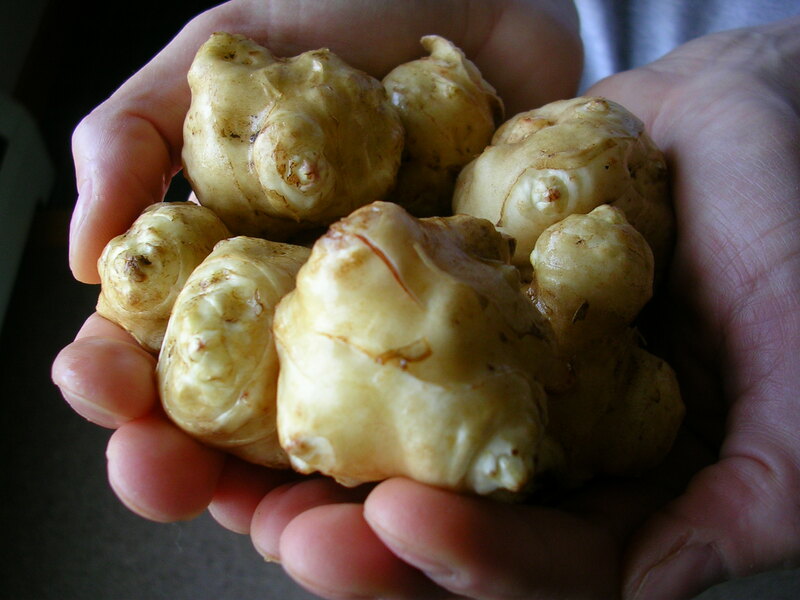 Jerusalem artichokes, aka sunchokes, are a native American crop. If that’s half a good enough reason to plant them, their wonderful taste and texture make up the other half. I love artichokes, yet my two attempts to grow real artichokes in the garden, in the rainy summer two years ago, and again this summer, failed miserably. Jerusalem artichokes taste like artichoke hearts, but without the hassle of removing the leaves to get to the meaty portion. The plants usually grow about six feet tall. Because of abundant rain, mine were so high that I needed a ladder to spot the small, sunflower-like heads. The tubers should be dug after the first frost, which came in the form of a major snowstorm in late October. Lacking a cool basement or a root cellar, I store the Jerusalem artichokes on the basement steps leading to an outdoor Bilco door. That’s fine for now but in sub-zero weather I will need to find another place, as the tubers should be stored close to 32 degrees F. To keep the moisture at the required 95 percent I spray the sunchokes with water every now and then. Properly stored they should keep through the winter. After much scrubbing, the tubers are spick and span and don’t need to be peeled. But for this salad, I wanted uniform pieces so I trimmed and peeled them. The peeled Jerusalem artichokes must be immersed in acidulated water (lemon juice or vinegar) immediately to prevent them from browning. 1. Lightly toast the walnuts in a pan without oil. Remove them from the pan and set aside to cool. 2, Thinly peel the Jerusalem artichokes with a vegetable peeler. If they are very gnarly, trim them a bit to make peeling easier. Halve or quarter depending on size. Drop them immediately into a bowl with water and a few tablespoons of white vinegar. 3. Heat 1 tablespoon olive oil in a pan. Drain and dry the Jerusalem artichokes with paper towels and fry them in the hot olive oil for about 5 minutes, just long enough to brown them a bit from all sides. turning them often. Remove with a slotted spoon and set them apart on a plate lined with a paper towel. It is important to give them space when they cool, otherwise they will turn soggy. 4. Peel and quarter the apple, remove the core, and dice. Put them in an salad bowl and mix with the lemon juice immediately. 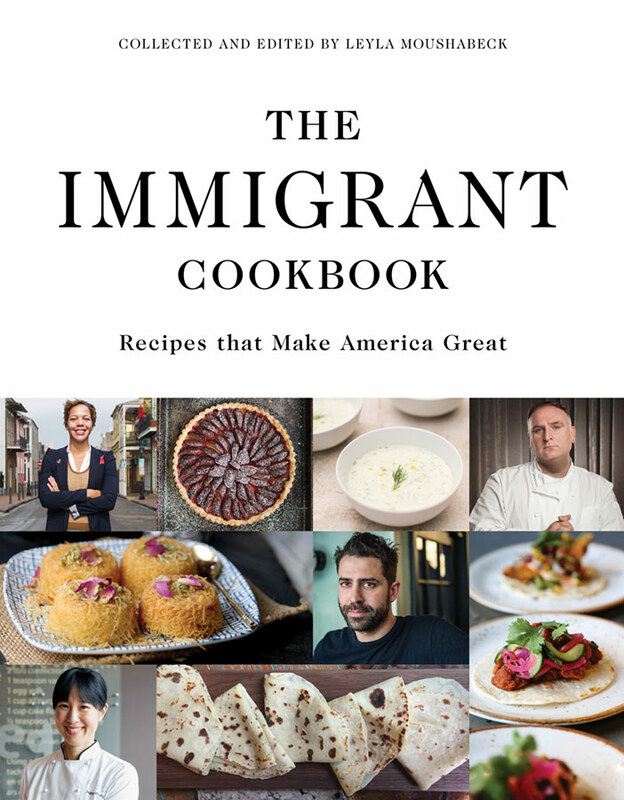 Slice the celery and add. 5. Whisk the extra-virgin olive oil with the apple cider vinegar. Add salt and pepper to taste. 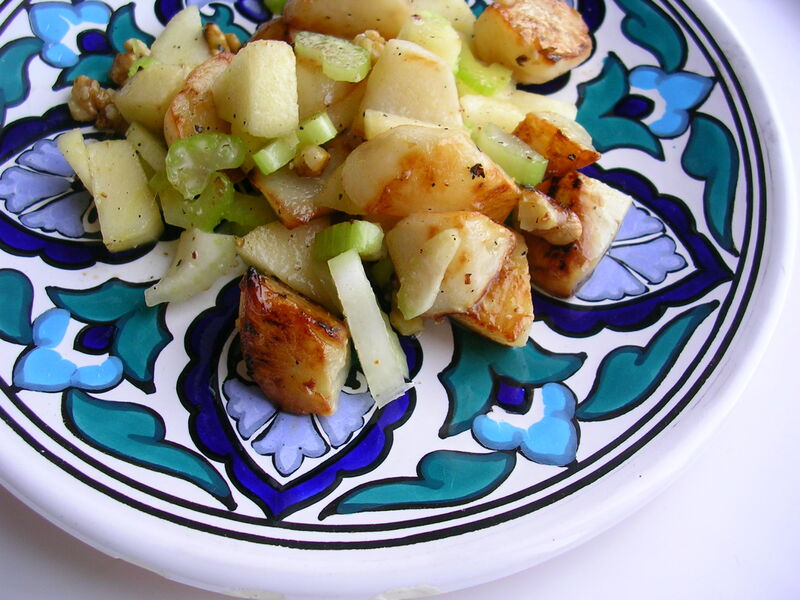 Coarsely chop the walnuts and add them to the bowl with the cooled Jerusalem artichokes. Toss and serve, or refrigerate. did you ever find a good way to store your j-artichokes dry? you said you might have to move them once the freeze set in. We just harvested two full five gallon buckets of this tuber before realizing that virtually everyone says to pickle or freeze them. we have a basement laundryroom and storage room to work with. Could you give me a little feedback on what you found that worked best? Hi Dan, I ended up storing them in 1-gallon freezer bags in the vegetable drawers of the fridge. I left the bags open to allow air circulation and placed a damp paper towel on top that I sprayed with water every few weeks as needed. I had a few molded ones but otherwise that worked well, I used the last Jerusalem artichokes in the spring and they were still crunchy. But I guess your two 5-gallon buckets would be too much for the fridge… I don’t know anything about freezing or pickling but I think for freezing it might be best freezing them already processed in the form you want them afterwards, cooked and pureed for soups, blanched and sliced for gratin etc. That takes up less space and I imagine whole JA will be soggy upon thawing, so you would not get that crunchy bite any more. – Just curious, as JA are best harvested after frost – where are you located? We are in northeast Pennsylvania and expect the first frost tonight. – If you come across a good recipe for pickled JA, please let me know, as I might be looking for ideas myself in a few weeks. Good luck!